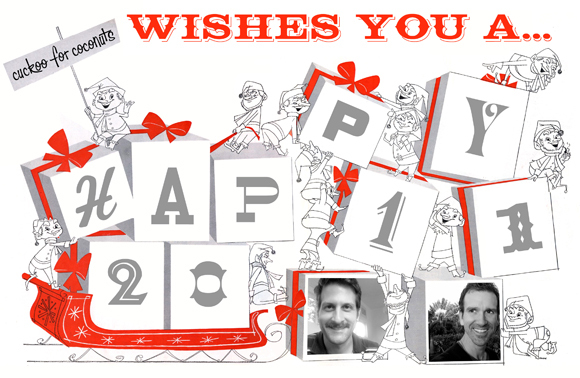 HAVE A HAP-HAP-HAPPY NEW YEAR! More covers from the magazine archive. Here we have some of my favorite things, collage, typography, and christmas, all directed by the very talented Henry Wolf. In an essay by Milton Glaser for AIGA, Glaser describes his first impressions of Wolf, "When I first met Henry Wolf in the fifties, he seemed to be the most sophisticated person I had ever known. He owned a Jaguar, was always in the company of beautiful women and was already clearly the best editorial designer in the world." 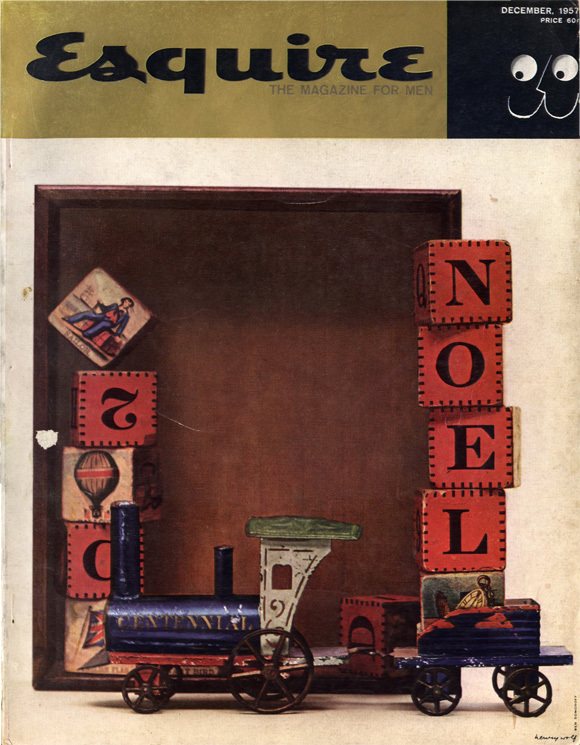 And here's a good article by Steven Heller about Wolf called Remembering: HENRY WOLF, 1925-2005 wherein Heller describes Wolf as "outspoken on the state of magazines in general, and quick to note that good content was neutralized when editorial material and design were not in sync." I especially like the simplicity of his work. But in the simplicity is a lot of meaning, richness, and, in most cases, very clever graphic solutions. 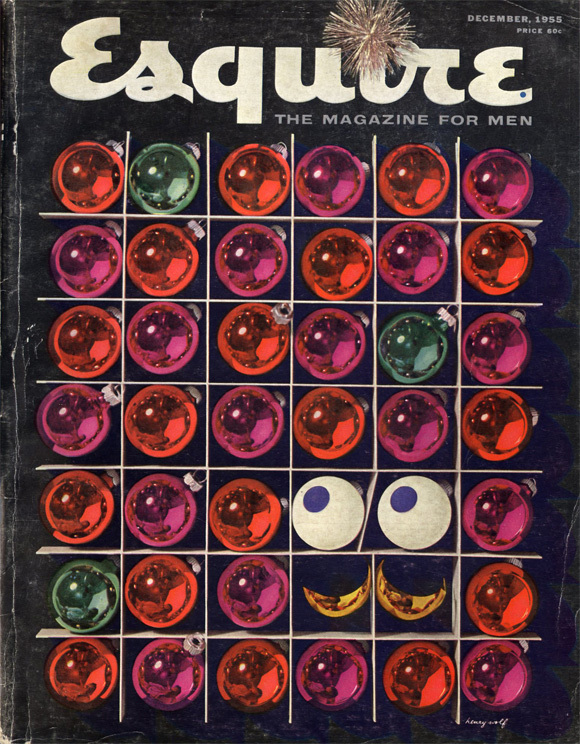 This December cover of Esquire from 1955 has the magazine's mascot "Esky" integrated into the grid of ornaments. This was a conceit that Wolf himself had started and tried to do in all his Esquire covers. If you look close, you can see the reflection of a man in in the ornaments, especially the gold ones. My guess is it's the photographer Dan Wynn. Another December cover of Esquire. This one featuring antique toys. Photo by Ben Somoroff. 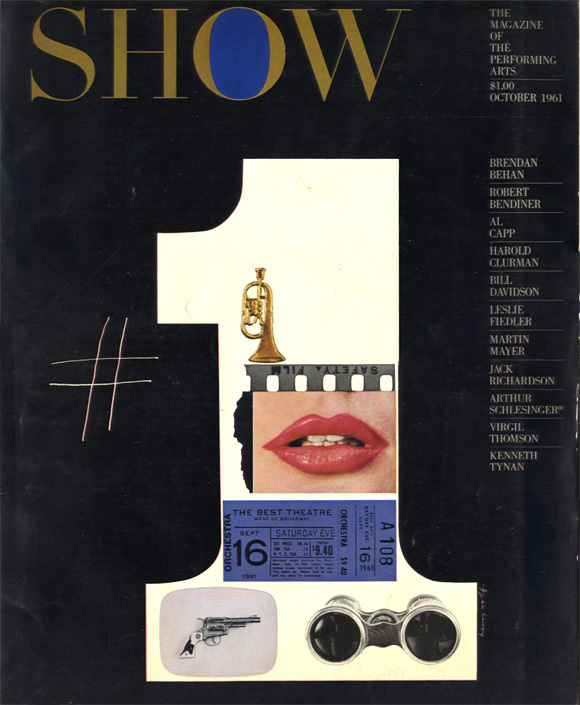 After reinventing Esquire in the mid-fifties and Harper's Bazaar in from 1958-1961, Wolf had the chance to totally invent the look and influence the direction of the modern and progressive arts magazine called Show in the 60s. This is his very first cover for that publication. In my research, I found another cover that he did for Show from April 1963 that reminded me of the cover I designed for Imagining America. A little late, but hey, it's still Tuesday here... and the shortest day of the year! Many moons ago, I acquired these unusual Warhol Christmas cards. 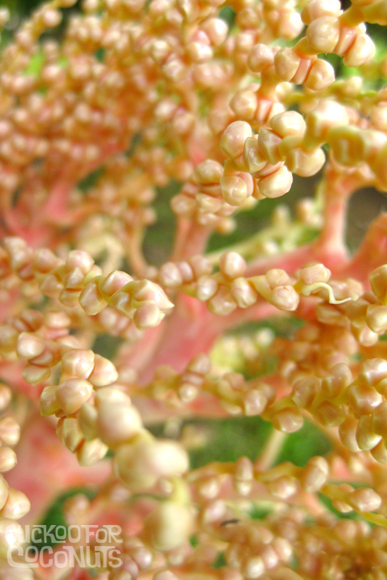 And no, this post is not tropical or home-oriented, it's just seasonal. 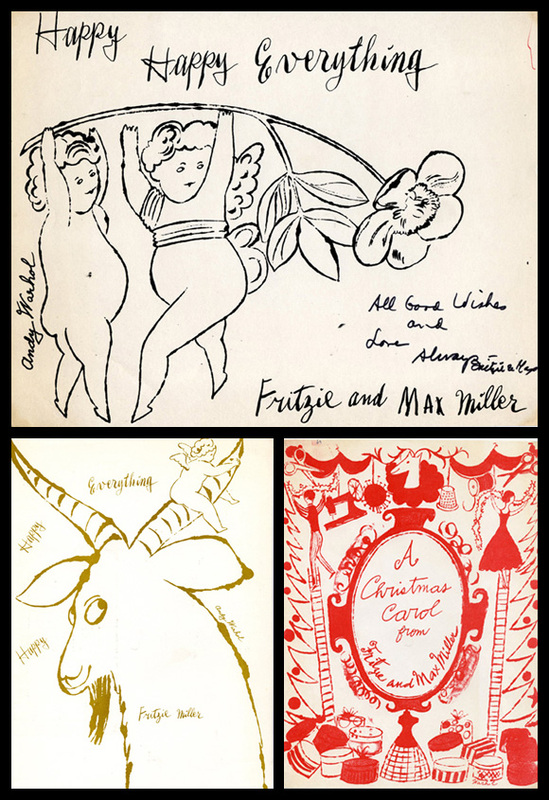 I'm cuckoo for mid-century illustration, and Christmas, and well, Warhol too. So you're basically looking at a trifecta of aesthetic yuletide proportions here. Plus it has the universally gleeful greeting of "Happy Happy Everything" that works in a pinch every time. I know very little about these cards. I say "cards" because they are printed on card paper but they aren't folded like a traditional greeting card. They could be the dismembered fronts of folded cards or they could have been a grouping, made as a portfolio of printed pieces. The backs are completely blank. 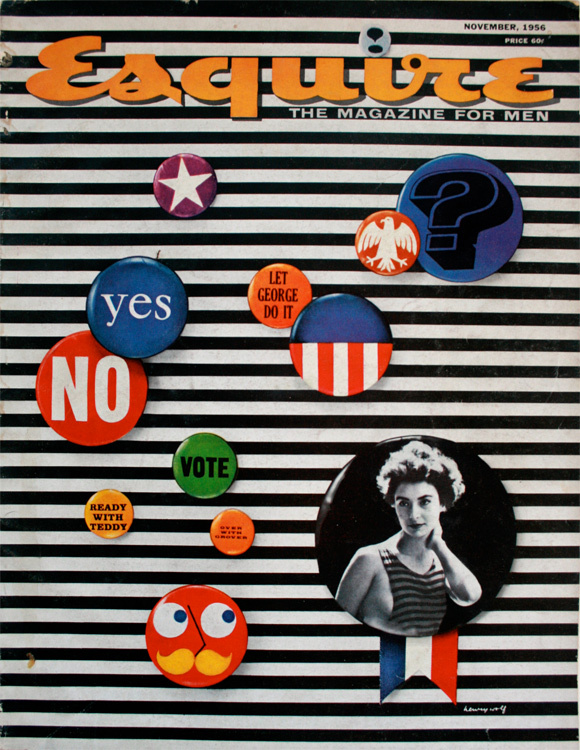 My best guess is this: Back in the late 50s early 60s, Fritzie Miller was a cool, modern-thinking artist representative with a roster full of hip young designers and illustrators for whom she found work at the chic magazines of the day like Harper's, Vogue, Esquire, etc. 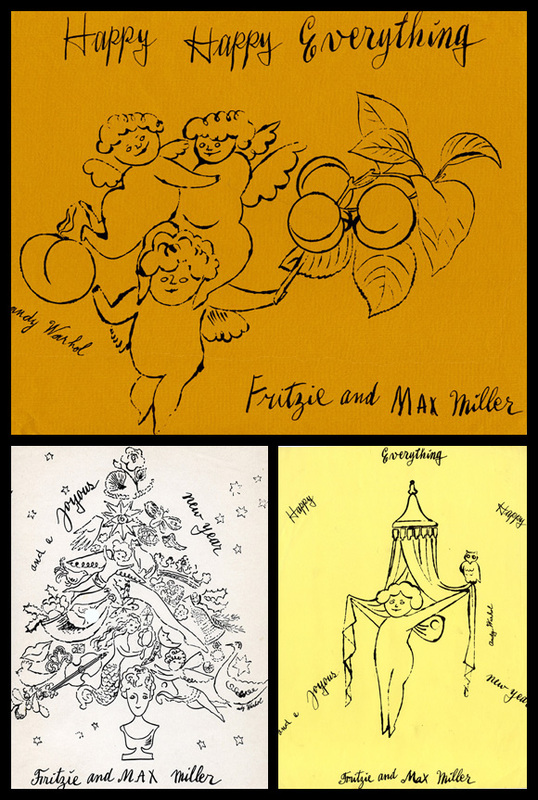 So being that these cards are "signed" from Fritzie and Max Miller, I'm thinking she had her artists take a piece from their portfolio and repurpose it as a card. I say this because I'm pretty sure I've seen some of these illustrations in their original settings. If anyone has any more info about these, please do let me know. There are a number of books that have good compilations of Warhol's commercial illustrations (which half the time were not even drawn by him as he employed people like Nathan Gluck and others to do the physical drawing based on his style) We have a few of these books, my favorites are Pre-Pop Warhol and Andy Warhol: Illustrations and Drawings of the 1950's. West maui and the Island of Moloka'i (to the right with the 2 peaks). Since yesterday was such a rainy wet and cold day, I went to town to run errands. I think everyone else on Maui had the same idea, because it took about 2 hours longer than it usually would. 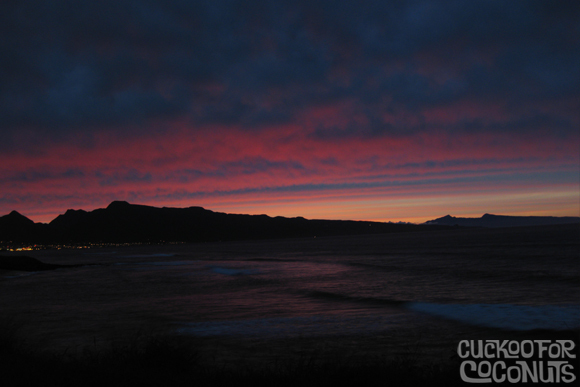 But as luck would have it, that delay allowed me to stop at Ho'okipa Beach Park and take in the beauty of the sunset. It's rare we are ever in town at sunset and even rarer to see West Maui and Moloka'i so clear, especially since the entire day was gray. By just sitting here for 10 minutes taking in this beauty... it literally cleared my mind after spending a rainy Friday afternoon battling the crowds in town. 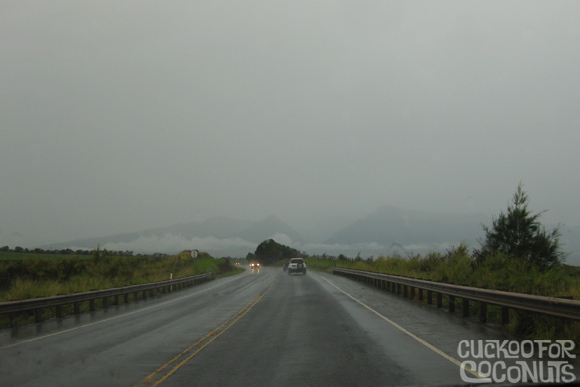 The view of West Maui approaching Ho'okipa on the way into town. 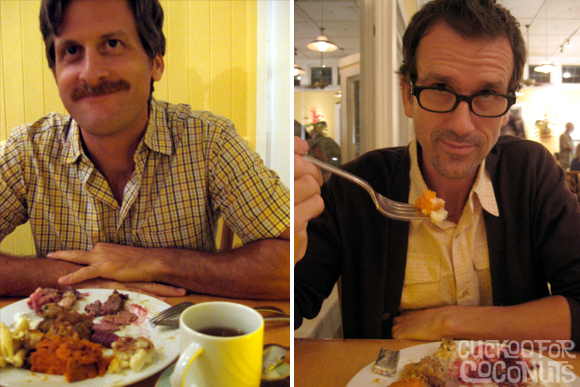 Last night John and I went to Mama's Fish House to celebrate the 10th anniversary of our blind date. Yep... 10 years. Anyway we won't bore you with that... let's talk about the food! 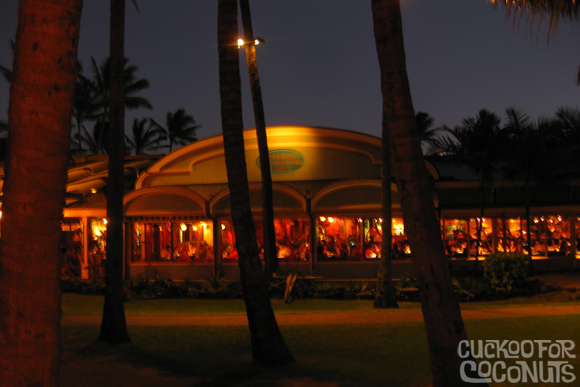 Mama's is by far one of our top 5 favorite place to eat here on Maui. The atmosphere from the minute you step out of the car at the valet stand is one of serenity and calm and sort of feels like you are stepping back in time. The views are really spectacular. Once you have checked in you can have a seat in the bar, out in the garden area or out by the beach. The open wall design of the building just what you hope for when dining out in Maui... right on the beach no less... why would you want to be trapped inside 4 walls with no view outside? The beach is packed with coconut palms for that extra tropical punch. The sunsets from here are some of the best... but a little hard to catch in the winter months when the sun sets way to early for us to have dinner. If you happen to make it here, do try to check sunset times and get a table for sunset dining. A few minutes before the sun sets and the sky starts it's colorful transformation, the wait staff stops serving so that everyone can enjoy the show. 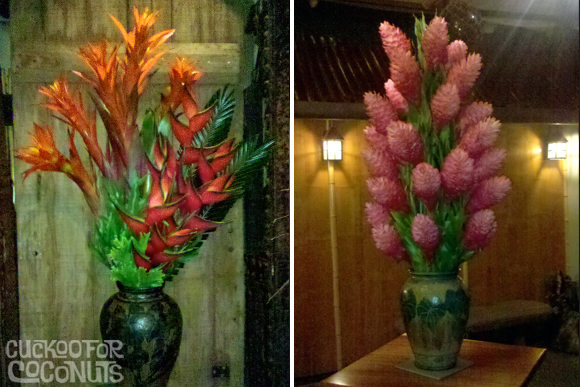 The flower arrangements are always dramatic, yet understated. 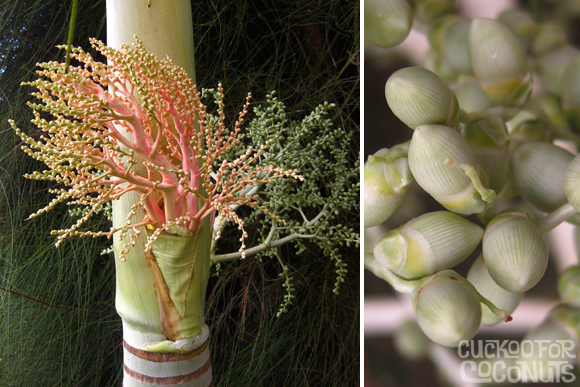 I mean look at the giant column of Pink Ginger, which stood about 4 feet tall. Not a blemish on a single flower. The mood of this place is unparalleled as far as we are concerned. Usually packed to the thatched roof, this is one of the quiets place we have ever eaten in... it always is. With the open air dining, it was quite chilly last night and we kept wishing we had worn socks. 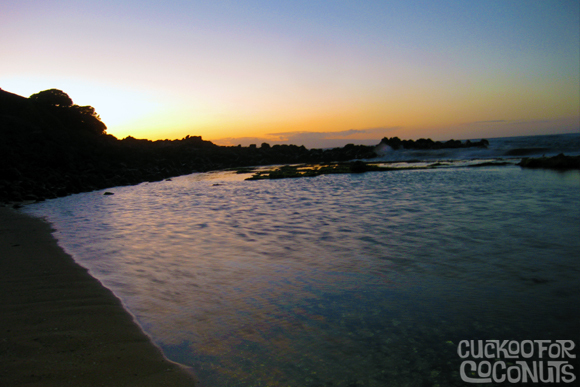 (Maui is experiencing record lows.. just 2 nights ago Kahului was a record low of 55 degrees.... brrrr). To start we ordered drinks. 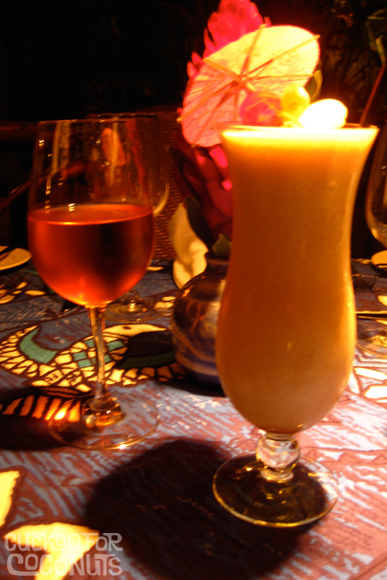 John opted for a glass of wine while I went for a Relaxer, which is a frozen drink of Creme de Cocoa, Pineapple Juice, Coconut Milk and Vodka. It certainly lives up to it's name. 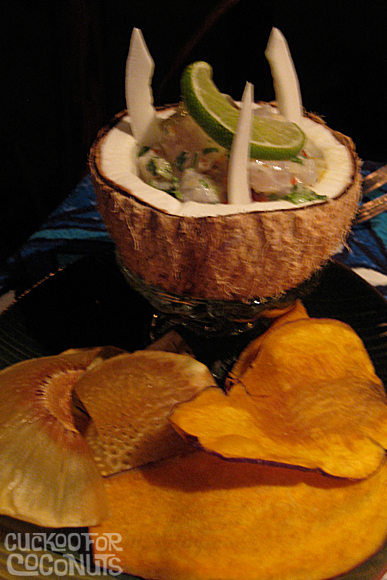 Uku Ceviche – marinated in lime, cilantro and Maui chili pepper. Served with sweet potato and breadfruit (ulu) chips. Wasabi Crusted Calamari with Kula vegetables and edamame. We usually end up getting the same thing every time we make it to MFH, but tonight we broke free of our wickedly delicious ways and tried all new dishes. 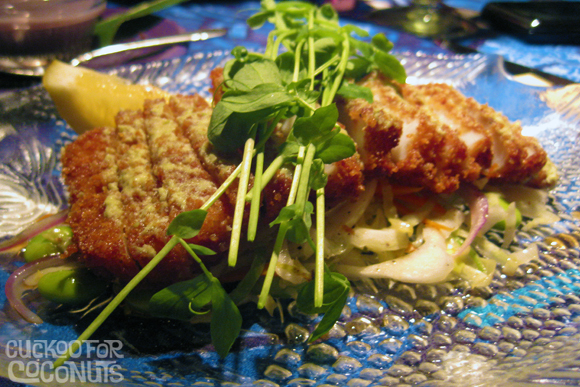 John had the Uku Cheviche to start, which is a grey snapper served Tahitian Style in a half coconut. I had the Wasabi Crusted Calamari which is a good 1/4" squid steak rolled in bread crumbs serves on sauteed cabbage, onions and edemame. Both were so soft and tender you really didn't even need to chew. Poi and John's entree of Deep-water Ahi caught by Leonard Huddy off the east end of Maui served on a sugar cane skewer with Peppercorn, grilled with Hamakua mushroom sauce, sweet-potato mash and asparagus spears. I had the Onaga caught by Layne Nakagawa over deep reefs near Olowalu Sautéed with Haiku tomatoes, garlic butter, white wine and capers. Served with chili zucchini medley and saffron rice. The last time we went to MFH, I requested a side order of poi and was told that the poi was reserved only for the Luau Plate. 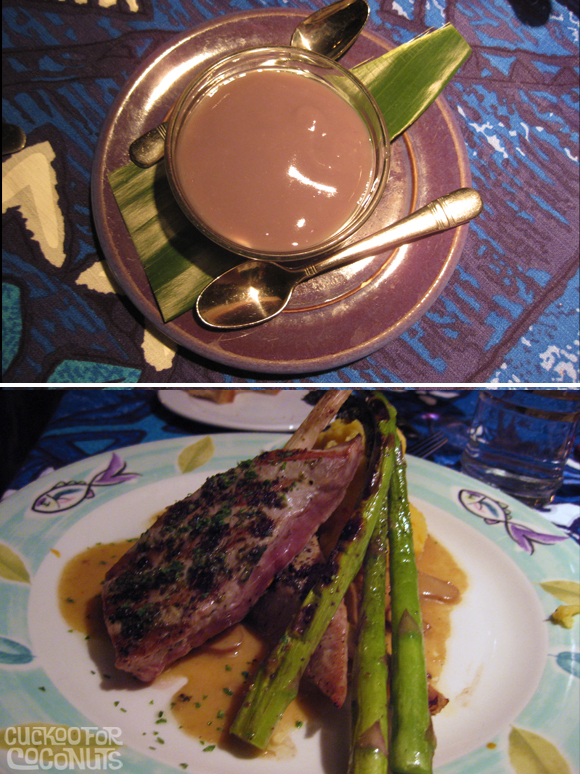 I had the Luau Plate once before and really enjoyed the super clean tasting poi. So last night I was overjoyed to see the word "Complimentary Mama’s fresh Poi upon request." Doused with their homemdae chili water... so ONO! John said his Ahi was extremely tender and a wonderful grilled flavor. Other than the fact it tasted like super-clean-fresh tuna. The potato mash was very subtle as we believe it was a mix-mash of sweet and regular white potatoes. My Onaga - a was quite simply the best fish I have ever eaten. EVER. It was moist, tender and for lack of a better description, completely flavorless... meaning no fishiness at all. I could have eaten another piece. I was not too jazzed to see the zucchini turn up on the plate, but once I tasted it I was pleasantly surprised and loved the chili pepper spiciness they cooked it in. The portions as you can see are very substantial. None of this tiny-food-on-a-giant-pate-with-high-prices crap. You really get your money's worth here. 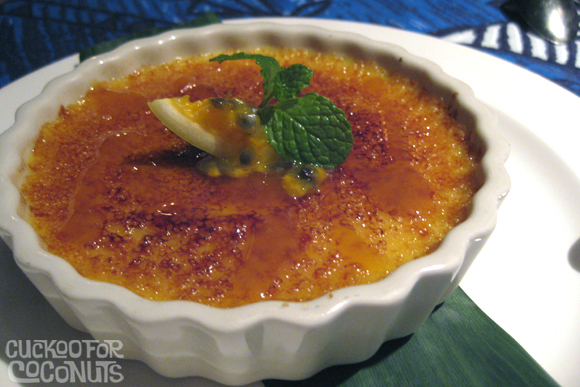 For dessert we split the Creme Brulee with fresh Liliko’i. We have had all of the desserts here and they are are equally delicious, but we don't make creme brulee at home... soooooooo. It's the perfect size to share at about 5" across. Too bad the meal had to end. See you next year Mama. 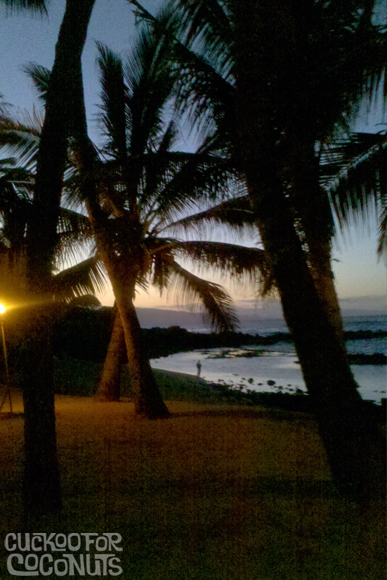 Better late than never... but it IS still Tuesday here in Maui. 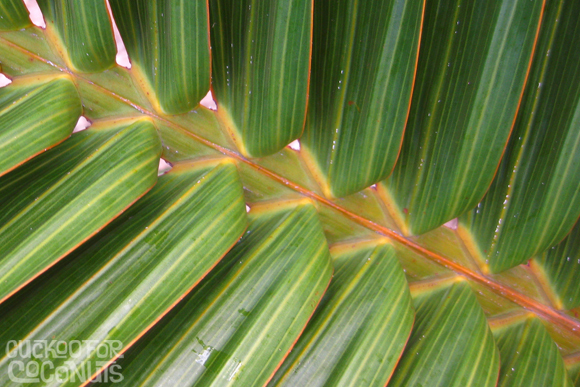 Immature manila palm seed rack. Immature seed rack and another about a month older. These will eventually be about the size of crapes and turn a fiery red. 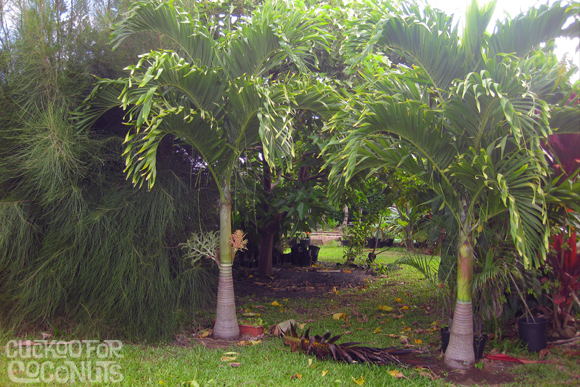 Two of our 5 manila palms that are just starting to put off seed racks. Stripes, stripes and more stripes. 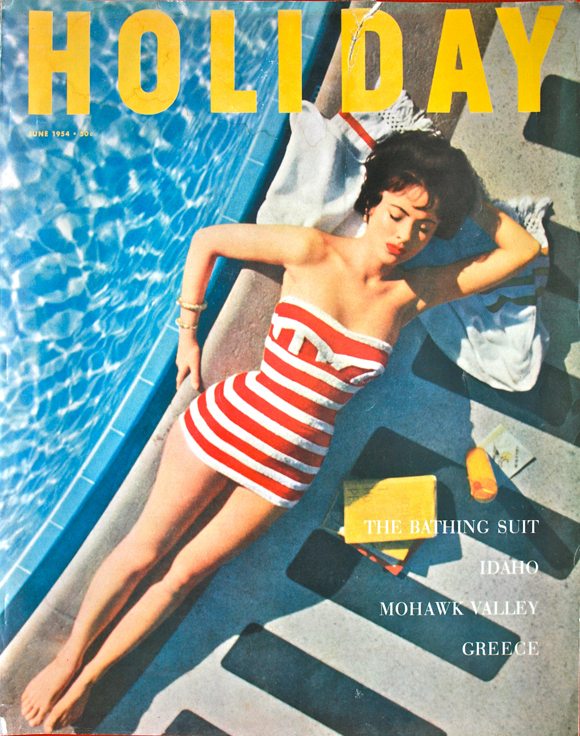 Each cover in this latest post has it's own visual language based on stripes. 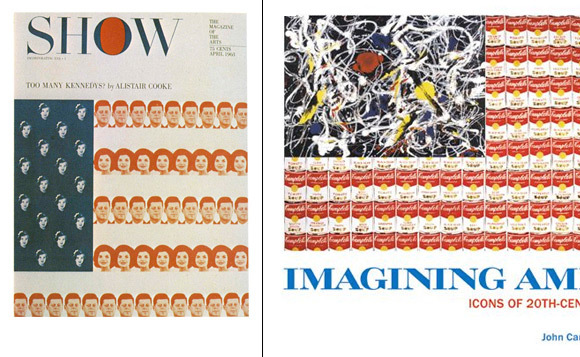 Two of these, Harper's Bazaar and Esquire, were designed by one of my favorite art directors Henry Wolf. The Holiday cover was art directed by Frank Zachary. Interesting note, the caption for the cover credits begins with, "The tasty dish in candy stripes on our cover is Mara Lane..."
I also love how Henry Wolf signed his cover creations. In doing research on Henry Wolf I found that he was only at Bazaar for a few years before joining Show for their launch in October 1961. 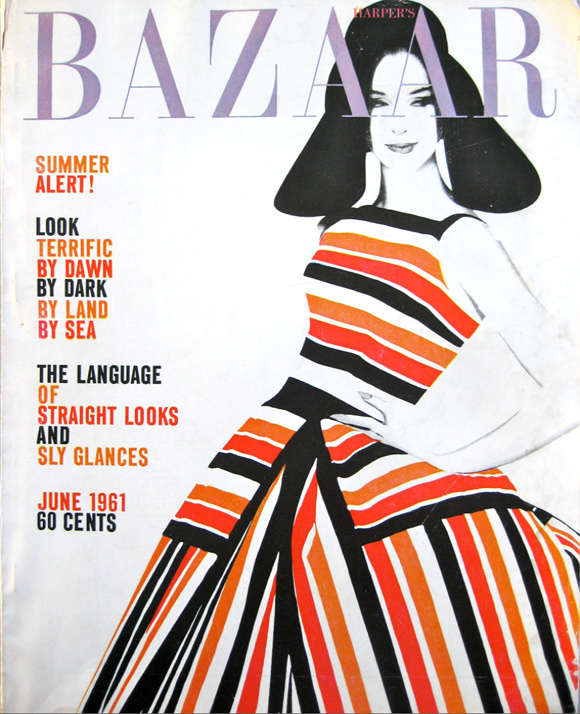 The Bazaar cover from June of that year (in this post) was one of his last for that publication. I think I sense a future post of all my Henry Wolf covers. Just above Ali'i Kula Lavender with the central valley below and West Maui behind us. Thanksgiving was a bit different around here this year. No brining of a turkey. No wrapping one in bacon. No drying bread for dressing or mashing potatoes. Nope. This year we took the day off. Off from commissioned work, yard work, house work, cooking and dishes. We woke up, lounged about and finally headed up to Polipoli Spring Recreation Area for a short hike about 5300 - 6000 feet above sea level. 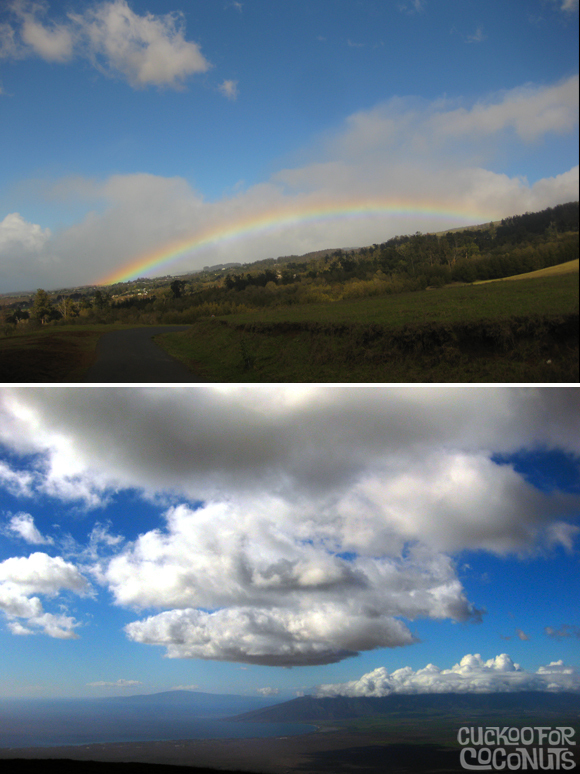 It's just above the Ali'i Kula Lavender Farm... about a 30 minute drive on a on lane pot hole filled and sometimes muddy road. 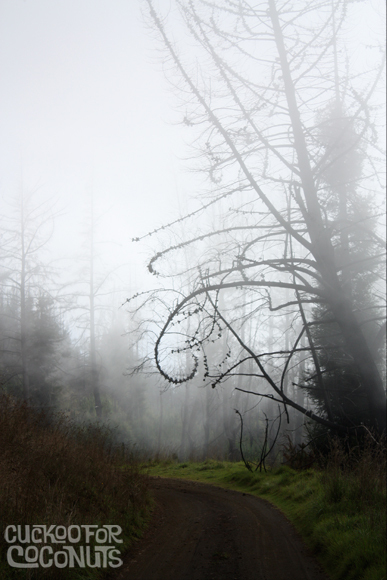 It's one of our favorite places on the island, but we have not been back since 2006 after it was subject to a massive fire in January 2007, which consumed over 4500 acres of this beautiful redwood and eucalyptus forest. 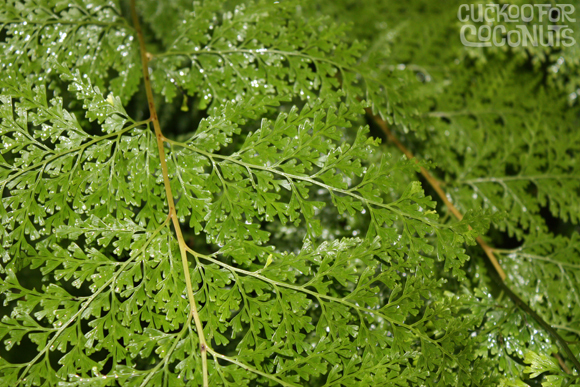 It's slowly coming back and we saw tons of new 4-5 trees sprouting up by the thousands. After a short hike where we got to see some amazing views of the West Maui Mountains and of the Big Island, we headed down to Hali'imaile General Store where we had dinner reservations. Mixed baby greens with wasabi peas, caramelized pineapple and goat cheese wontons to start. Roast turkey and gravy, prime rib with horseradish sauce, fresh corn chip and salsa crusted monchong (fish), savory chicken and pine nut stuffing, bread pudding with chestnuts and dried cherries, mashed potatoes, sweet potatoes, roasted vegetable medley, truffle mac and cheese, cranberry sauce, biscuits and pumpkin pie. After we piled our plates and consumed the massive amounts of food that sat before us, we could not even think about the pie, so they boxed up 2 slices with fresh whipped cream for us to take home. We can't tell you how great it was to not have to do all that cooking and most importantly... the cleaning up. Coming home to a spotless kitchen on a full stomach was a joy. It's really important to take the time and enjoy your surroundings no matter where you live. We all know to well how easy it is to get caught up in day to day chores and projects. We hope you had as great a day as we did. 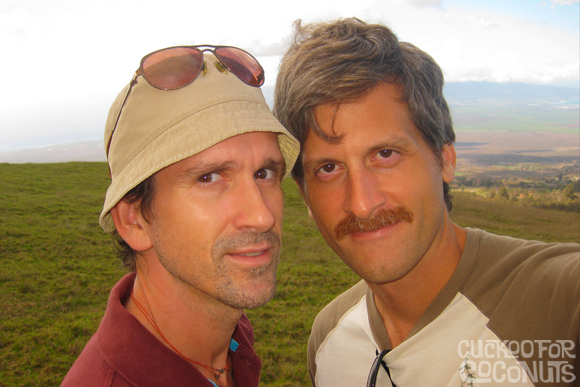 Here are some pics from a really gorgeous and completely relaxing, carefree Maui day. ps. 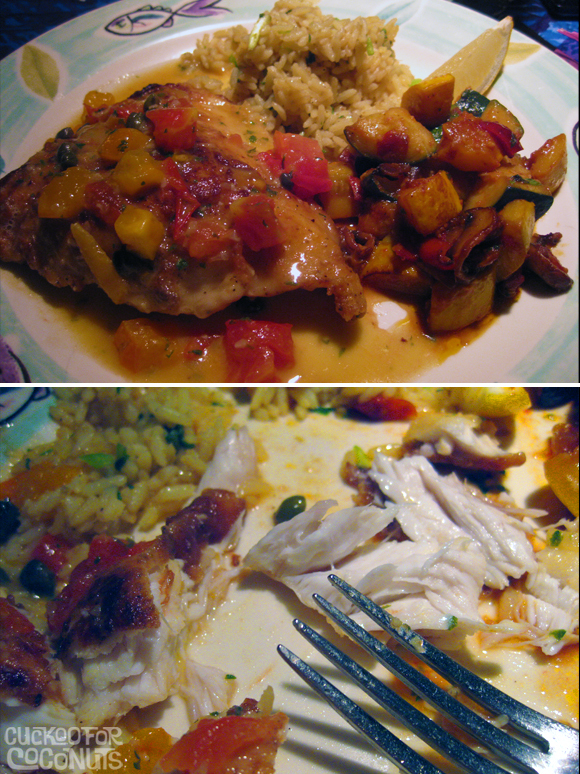 Many mahalo's to the staff at Hali'imaille for turning it out for those of us that didn't want to bother. Bottom: View of Ma'alaea Bay, West Maui and the island of Lana'i in the distance... not to mention those enormously heavy clouds. Top: Charred remains of a majestic pine with a few survivors in the distance and a slew of new trees making their way out of the charred forrest floor. 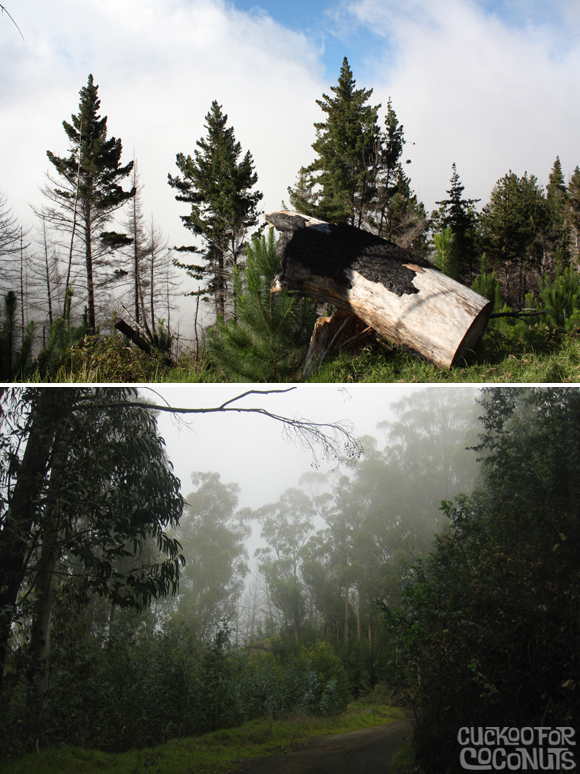 Bottom: A little higher up is the eucalyptus forest shrouded in fog and cool air which is scented with eucalyptus. 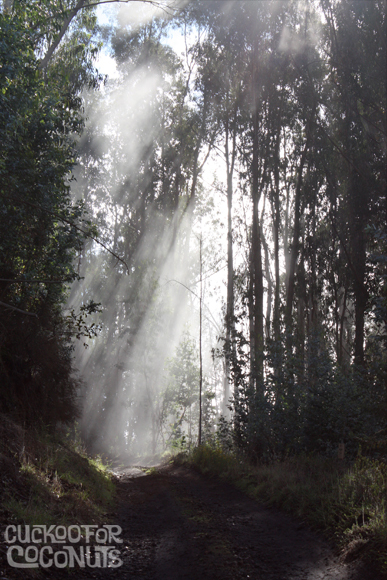 A magical moment as we were walking through the eucalyptus forest. 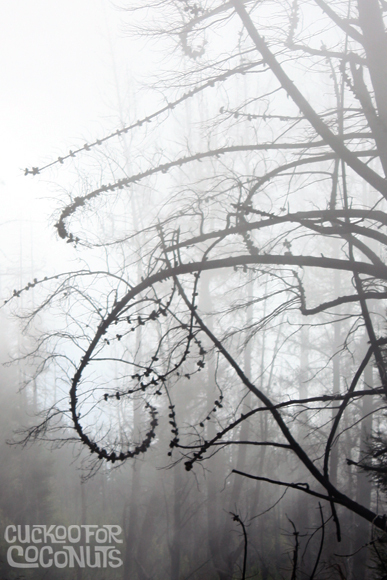 A very Tim Burton or Dr. Suess skeleton of a charred pine tree. A detail of the above pine shows gnarled branches still clinging to a few last pinecones, that look as though they are about to grab you as you pass by. 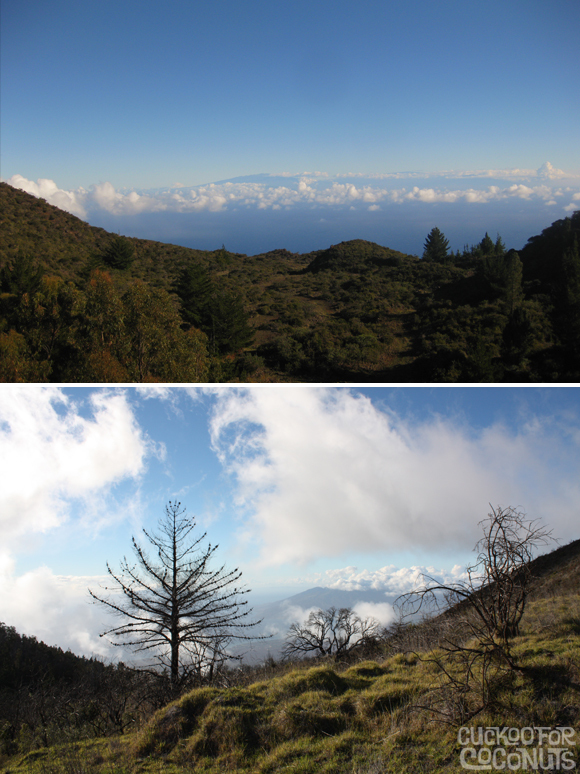 Top: Stellar views of The Big Island. 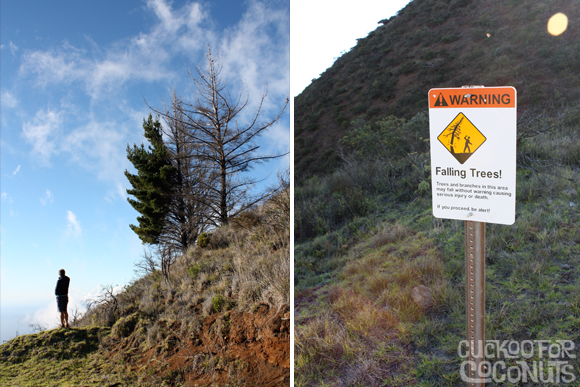 Bottom: A few more charred trees and West Maui. Top: Me with my new phone trying to find our coordinates high above Maui's last lava flow some 500 years ago. It's that black patch of lava down along the shore. 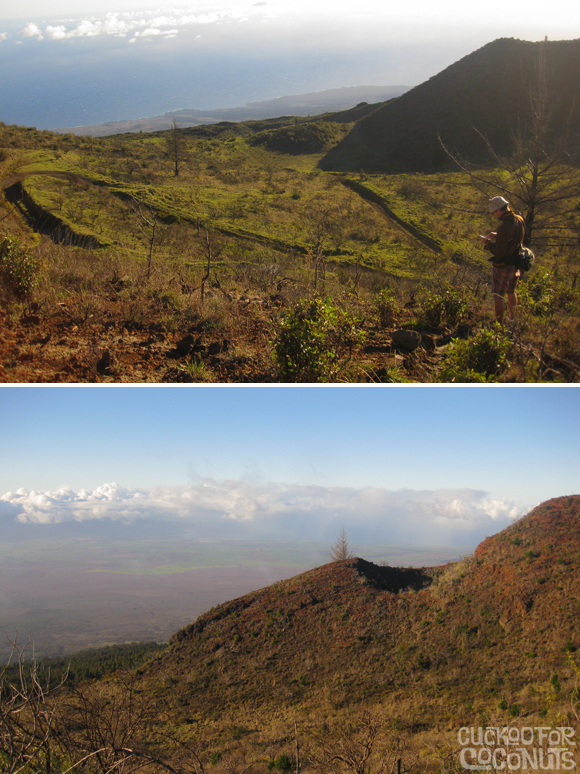 Bottom:A cinder cone from where lava once flowed and views of Maui's central valley. All the bright green way down there are the sugar cane fields. Um.... John... Did you happen to see that sign back there? 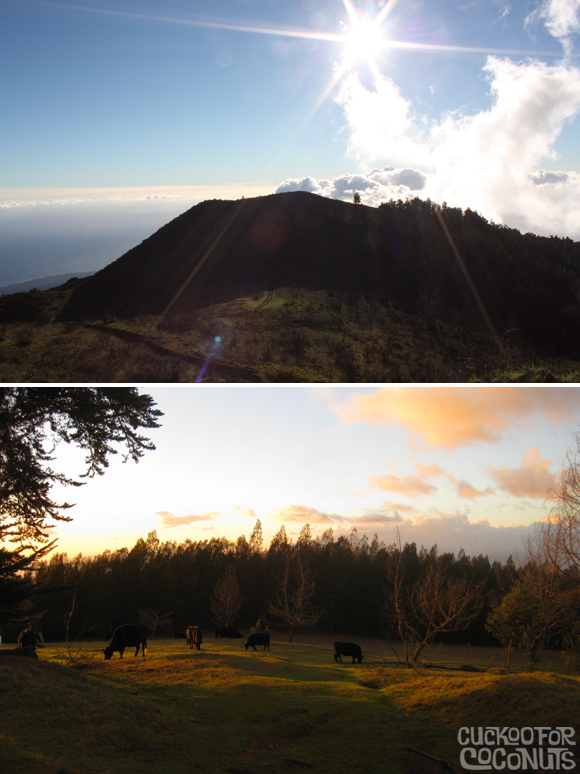 As the day draws to a close over a dormant cinder cone, we make our way back down the mountain through open fields of cattle and a painted sky. Plate is loaded... then it's not. 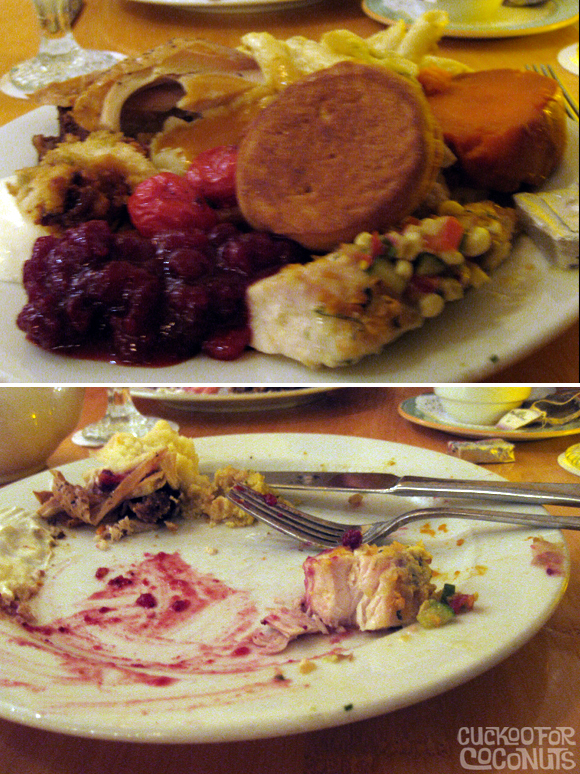 I ate it all... and managed to go back for a second helping of truffle mac and cheese. Do we look content or what? 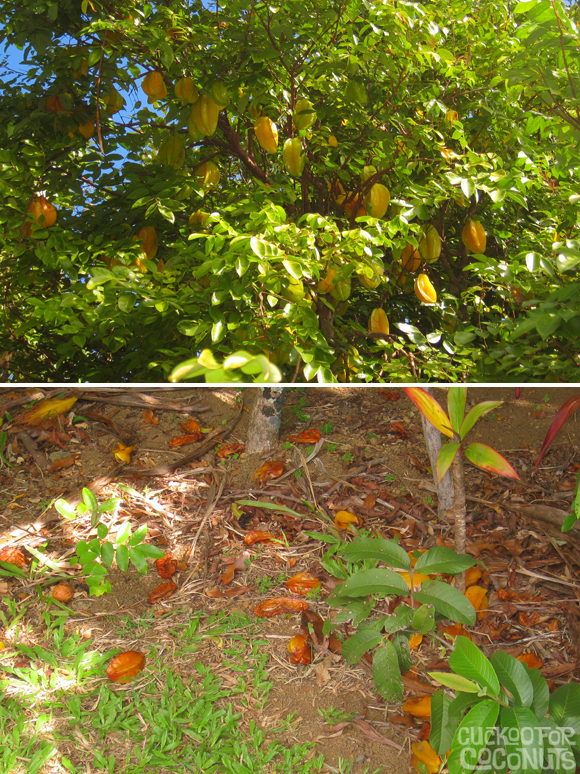 Star Fruit (carambola) season is in full swing here and I am trying to use them up as quickly as they ripen — which is no easy task. 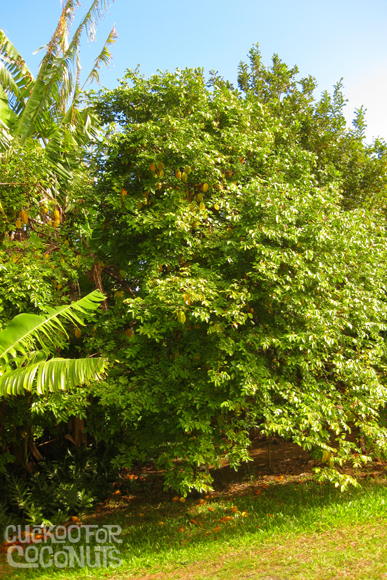 The loaded star fruit tree. I swear there are over 1000 on this tree. The sad part is when the ground is littered with rotting fruit. But the birds and geckos are happy... not to mention the gnats. 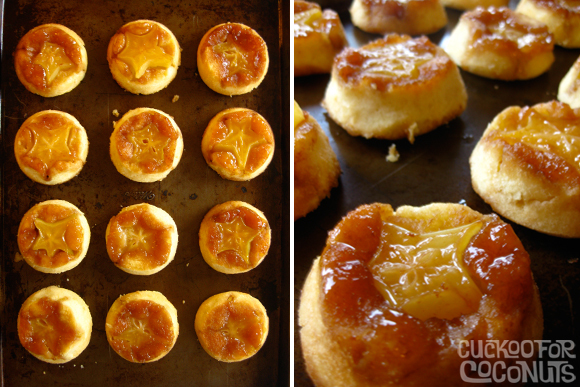 Saturday night I made a full size star fruit - upside-down cake for our friend Abraham and last night I made these Mini Shooting Star Fruit Upside - Down Cakes to take to our friend Liz's house for dinner. These mini cakes were inspired by the Hali’imaile Pineapple Upside-Down Cake at Hali'imaile General Store.... Where we will be having Thanksgiving dinner this year. NO COOKING HERE. 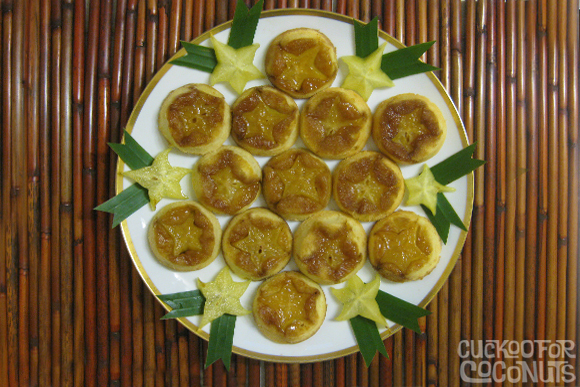 Mini Shooting Star Fruit Upside - Down Cakes. Arrange on a serving platter in a star pattern. This one is perfect for the holidays as it looks like a snowflake. 1. 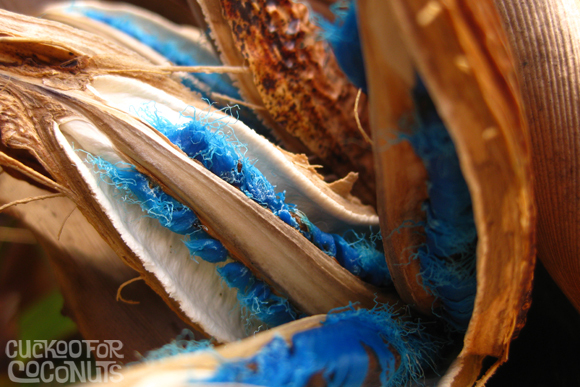 Wash and trim the outer ribs on your star fruit then slice 3/8" thick. Remove any seeds. 2. Heat the oven to 350 degrees. 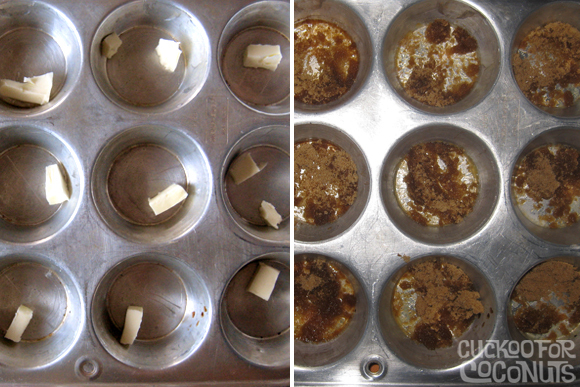 Divide the butter into 12 pieces and place in the bottom of each muffin cup. 3. Place the tins in the oven while it is pre-heating to melt the butter. KEEP AN EYE ON IT AS NOT TO BURN THE BUTTER. 5. Beat one-half cup softened butter and 1/2 cup sugar until smooth. Beat in egg yolks one at a time. Next beat in half the flour mixture, then half of the sour cream,repeat with the remaining flour mixture and sour cream. Beat until smooth. If you are using a stand mixer like a KitchenAid, then transfer this batter to a new bowl. Clean your stand mixer bowl and beat egg whites until stiff. Fold egg whites into batter. 6. Place 1 teaspoon of the brown sugar into each muffin cup and top with one slice of starfruit. 7. Pour approximately 1 heaping tablespoon of the batter into each cup. 7. 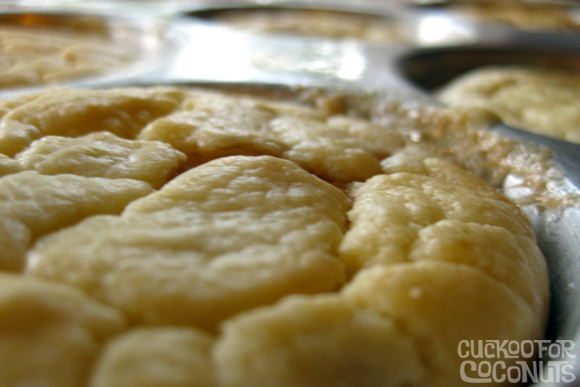 Place muffin tins on a cookie sheet to prevent any over bubbling from hitting the bottom of your oven. Bake 30 to 40 minutes, until the a toothpick comes out clean. I like to let them go just a tad longer to make the visible tops a bit crispy. 8. Remove from oven and slide a cake icing knife around the edges to loosen them. 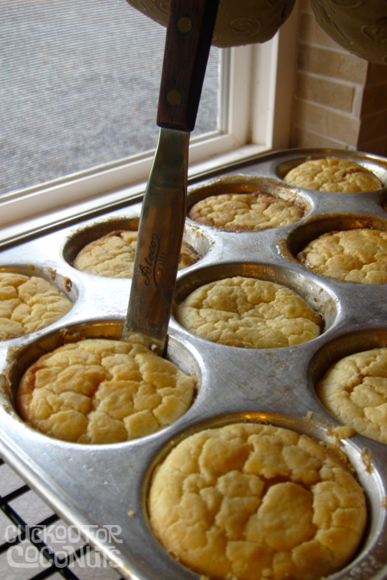 Place a cookie sheet on top of the muffin tins and Immediately turn out onto the cookie sheet. Serve warm or room temperature. * You can also reheat in the oven on on the stovetop in a cover skillet with a little butter for 5 minutes on low flame. ** You can also use just about any fruit for this you like: apple, mango, pineapple, peaches, berries, banana, pear, even orange slices with the rind removed...hmmm// now i want to try the orange version. 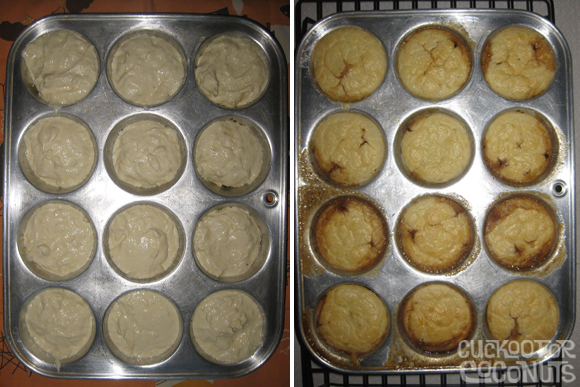 Melted butter and brown sugar in tins. 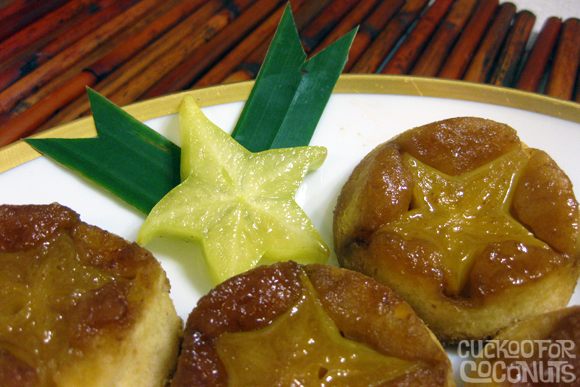 I thought I took a pic of the star fruit on the brown sugar — but iI didn't. Pour batter over star fruit, butter and brown sugar. Bake and remove when golden bubbly and crisp. Slice a cake icing knife around the edges. I like this knife because it's thin and flexible enough to get under the cakes as well as the sides. Turn out onto cookie sheet and cool. Place on serving platter and garnish with sliced star fruit and banana leaf sections with the ends cut into dovetails. If you don't have banana leaves, use paper or wired ribbon. Any color will do. Also, allow the star fruit slices to drain a few minutes on a paper towel before placing on platter to avoid starfruit juice puddles under your crispy cakes.